If you would to find a place that is not crowded on weekends, away from the crowded downtown Orchard, I guess this might be the right place for you. It is quite a relaxing place and the interior is all in white and the walls are decorated with some food-related pictures. 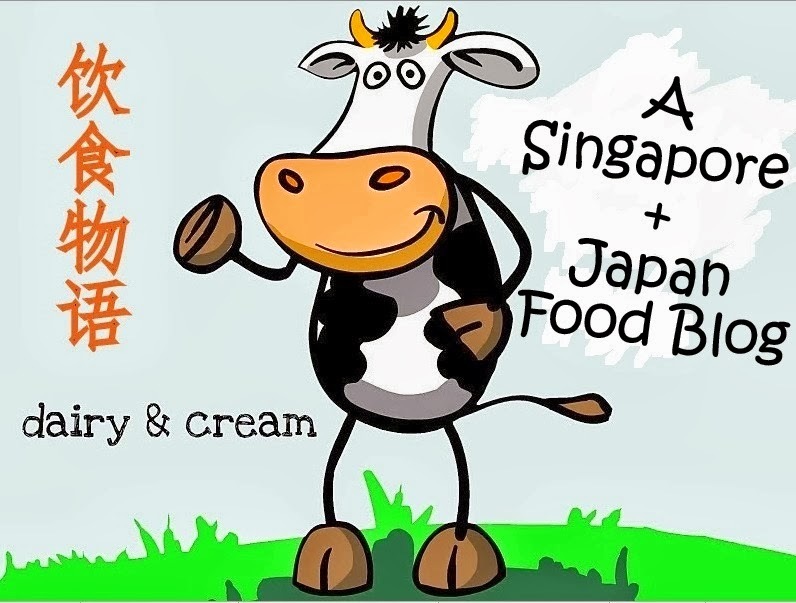 Its located in Serangoon Gardens just next to Sushi Tei. You would have to climb up the stairs in order to find this place. They do serve all day breakfast but I did not had the chance to try it this time round. Actually, the breakfast was recommended in the U-Weekly but shall leave it till next time then. They have sides, pastas and mains too. Having notice that their pasta are written as home made, I am more than willing to give them a try too. Also, its good that they have weekly specials and as u read further on, there are 2 weekly specials featured here. French beans, sauteed mixed mushrooms, roasted cherry tomatoes, Japanese cucumbers, pickled onions and mesclun leaves with basalmic dressing. I do not recall seeing any French beans though, but the pickled onions were unique in its shape and is extremely sour. Very good as a starter to whet a person's appetite. This was ordered by Pretty Mum so I had not done much tasting. After all, it's just salad which I would not think its worthwhile to order when dining outside. It's much value for money to eat them at home right? This is a main course on its regular menu. Compared to other restaurants, the number of filets on this plate is a lot more ( as they are being stacked up, not just existing as a single sole piece). The dressing of tomato & kalamata olive salsa was tangy, crunchy & savoury. A nice side to have along the fish as the filet is only lightly seasoned. However, I cannot truly say that the fish is really fresh but this is just a simply and tasty fare to have. The mashed potatoes were fine and smooth in texture but they were not mixed with spices. However, this is one of the best mash i've eaten so far. To me, this is a breakfast made with an Asian twist. The pancakes here are unlike the usual flat pancakes at other dining places. I liked that the pancakes are made in this shape and thickness. They were really moist, fluffy and not sweet at all. Hence, it went well with the gula melaka syrup. Sadly, some bananas were burnt, no longer only caramelized, hence Pretty Mum picked them out so that Little Sis would not have to eat them. Can you spot that little specks of vanilla in the cream? Having noticed that the whipped cream was not enough to go with the huge amount of pancakes, the chef kindly offered to provide Little Sis with more of them. The cream was really awesome and I think the chances of them being store-bought aka. commercial are very low since it tasted really fresh and light. We even spotted vanilla in the cream. How thoughtful! The portion of the dish was much bigger than I had thought. The veal cheeks were truly tender and succulent. They did not have any odd gamey taste and I must say that they are braised very well. Though the sauce was delicious, there was nothing particular special about it. I could not taste the red wine in the sauce. However, do not look down the veggies on the side as they tasted warm and not too hard . Guessed they must have been stir-fried for a while as they had a thin coating of shine. Did not regret ordering this dish as it was truly value for money. How about a cuppa of Cappucino? life's simplest things like Legos! ﻿﻿This product was out in Japan on March 7th 2011. Really impressed with the Japanese. They had a full pdf file to explain this product. 白色恋人的绿茶版本。Unlike the Santoritsu Langue De Chat below, the biscuit layer maintains its original taste and colour. Only the cream has changed to matcha flavour. This biscuit is harder in texture and thus less fragile. "抹茶クリームは香り高い宇治抹茶を使用し、まろやかに仕上げました。上質なラングドシャクッキー生地はきめ細やかで、口どけを楽しんでいただけます。宇治抹茶の風味と生地の甘さがうまく調和した一品です。" as described on the package. Although the packaging may not be as good as Mr Ito's, this is more superior in its taste. It has a stronger buttery flavour and its green tea cream is not that sweet. 口溶けの良いラングドシャになめらかな抹茶チョコレートをサンドしました。This is what i call melt in the mouth texture. In fact, there is no need to go after the super famous 白色恋人when we can get such good ones at much much cheaper prices. I suddenly realised that this is a good way to learn Japanese too. This is the last Matcha Langue De Chat version that I've found. Its the cheapest amongst all and I think its quite value for money. This cookie has a duller yellowish colour than the previous ones but its rather fragile and crumbly still. Although they are all Langue De Chats, its interesting to note that they are called differently in Japanese Katakana. Have you noticed that the packaging of the traditional white cream wafer has changed? This is not a langue de chat cookie but I like the fact that its rice wafer remains crispy anytime you consume it. I remember that Pretty Mum used to buy it for me when I was young. She herself enjoyed it too. But it has been ages since there is a new flavour. Oh yeah, the other time there was the boysenberry flavour if I remembered correctly. Would not compare this with the above langue de chat since they are different. The white cream version still taste the same but the matcha ones did not really had a strong green tea flavour. My 3rd visit to Cotton Bleu and I thought I was actually quite rash to place the reservation almost immediately after seeing the notice on the facebook. But well, it was a night of many first tries and I had not regretted going for this dinner. First, why Ch'ti? it is actually one of the dialects in Nord-Pas-de-Calais and so not only Singapore, China and Japan have dialects. Indeed, having this meal can make one learn more about northern French cuisine. The meal was cooked by Chef Herve and Madame Cotton. And all these food below were satisfying and comforting. It must have been 2 days of hard work, sweat and toil as I read that the restaurant was fully reserved and they even extended the special to Sunday as well. Also, I was glad that Black Faced Daddy and Pretty Mum enjoyed them too, since they usually prefer Chinese cuisine. Maroilles is a cow's-milk cheese made in the regions of Picardy and Nord-Pas-de-Calais in northern France. It derives its name from the village of Maroilles in the region where it is still manufactured. The tart is baked in puff pastry perfectly, giving this dish multiple textures. The portion is nice as an entree, but i think it would be great to have it for breakfast. Hah, what an indulgence! It contains bacon, onions, white cream around the Maroilles cheese (not too sure if that is sour cream or white cheese). The bacon is not crispy but does not have an overwhelming salty taste. The bacon was surprisingly a little sweet. Can you spot the little speckles of black pepper on top? This is really smaller than what I had imagined when I read the menu online. This was because the souffles that I came across ( be it on TV or during meals) are huge and served in ramekins. I guessed this was baked in a small sized tea cup, from the way it looks. Extremely savoury dish. It was quite dense in texture ( vis a vis other souffle) and the taste of cheese is quite strong. The strange thing is that the more you eat it, the more you like it. Can you spot the chunks of prawn meat and clams in the picture? This is the first time I taste such a unique souffle but I must say that the chef handled the baking time very well. Otherwise I believe it would not yield very even and tiny air pockets. According to "International Cuisine", the word "Cabonnade" is used to describe anything cooked in beer. ﻿This was Black Faced Dad's Main Course. But of course everyone shared a little here and there. I really appreciated the way the salmon was cooked. It was not just simply grilled or pan fried. BUT SURPRISE! there was a layer of coating for the salmon, helping the salmon to absorb all the tasty juices of the sauce. Though the colour of the sauce is not dark ( as i thought from the word "BEER"), there was a hint of bitterness in the sauce. I licked up almost every single drop of sauce with my fries! Well, since Mastering the Art of French Cooking describes the dish as "certainly one of the most delicious beef dishes concocted by man. ", what more do i have to say? I would try to order this dish whenever I have the chance to try some French cuisine, since it is a classic and will be a good test of the chef's skills. The seasoning is lighter than others that i've tried but the sauce has a natural sweetness to it. Pretty Mum says that it must be from the vegetables like onions and carrots that have released their flavour. The beef was superbly tender, easy to rip apart and put it straight to your mouth. The sauce for this dish is really heavier than the beef stew, but somehow I prefer this to the beef, especially since this is also the first time I came across Prunes as an ingredient for savoury dish. There is a sour tangy flavour as I continued my journey down the bottom of the orange pot. generous chunks of pork filet. Yums! While I thought I should not finish the entire pot of sauce in case I will be thirsty later, I could not help but keep on dipping the fries, as well as the mash potatoes of the beef stew into the sauce. It was heavens. Oh, and I noticed that the pork filet was way much more tender than the other kind of pork dish that I had on my first visit to Cotton Bleu. I understand that this was a different cut but it really scored high marks. I thought sugar tart would be those typically baked in a tarte sucre but ooh...this is actually a brioche! like eating bread. ﻿﻿Pretty Mum, who usually does not like spices in her desserts, actually likes this dessert a lot. While the ice cream was a little too frozen, we were too impatient to wait for it to thaw. So all of us scramble for the ice cream first. Poke here, poke there, but the ice cream had a full bodied SPECULOOS taste. Speculoos are a specialty from the North of France and Belgium. Originally baked as a treat for St-Nicholas' day, those thin, crunchy little cookies, flavored with spices, are baked in long rectangular molds that form a pattern on them : a saint's figure or, more commonly nowadays, the brand name. They are baked year-round now, and are widely available in supermarkets all over France. Depending on whom you ask, the name "speculoos" may come from the latin species which means spice, or speculator which means bishop. They go particularly well with coffee, and are often served one with your espresso in cafés in the North of France and Belgium. One of the best chocolate tarts in Singapore so far. Really, no joke, those who like chocolate can just go and da bao this to try. Instead of the usual butter crust, this crust is actually the same kind of digestive crust like the Raspberry Cheesecake I had the other time. The chocolate filling was not sweet at all, and in fact was commended by Pretty Mum, who usually is hard to pleased with chocolate desserts ( for she likes dark dark chocolates). Surprisingly, Black Faced Dad was fighting with me over the biscuit crust, which i managed to stop him from doing it in time before its all GONE. This was not listed on the Ch'ti menu but the host graciously allowed us to have it as one of the desserts, otherwise we would have 2 Speculoos Tart. Hence, I would like to thank the host and the chefs very much. Great idea for me who like to sample a wide variety at one go. I have said to Pretty Mum that this would be my final visit here. Not that the food is not good, but that this is the first restaurant that I have come so many times and I would have to move on to try others on my list. Haha, but well, if there are newer creations in future, who knows? 用叉子一敲，里头的lava 立刻流出来。看了就会自然的说 “ooh..." 而且味道是苦的！！太棒了，终于有一点像样的甜品了。难怪是价位最高的。可是，说实在的，如果单是蛋糕来评论的话这个还是贵了一点，因为曾经吃过类似的，可是价钱比较便宜。And I just realise the almond snap shown in their facebook picture is missing here. 他们的主打菜还包括duck confit. 菜单上也有pasta , sides and starters. The Home Baked Episode: Coffee, Tea or Chocolate? Cacao + Kome = Bingo! !